For more details on each of these methods, see Algorithms. The filter adapts its weights until the error between the primary input signal and the desired signal is minimal. The mean square of this error (MSE) is computed using the msesim function. The predicted version of the MSE is determined using a Wiener filter in the msepred function. The maxstep function computes the maximum adaptation step size, which controls the speed of convergence. Create the dsp.LMSFilter object and set its properties. lms = dsp.LMSFilter returns an LMS filter object, lms, that computes the filtered output, filter error and the filter weights for a given input and a desired signal using the least mean squares (LMS) algorithm. lms = dsp.LMSFilter(L) returns an LMS filter object with the Length property set to L.
lms = dsp.LMSFilter(Name,Value) returns an LMS filter object with each specified property set to the specified value. Enclose each property name in single quotes. You can use this syntax with the previous input argument. For more details on the algorithms, see Algorithms. Length of the FIR filter weights vector, specified as a positive integer. 'Property' –– The property StepSize specifies the size of each adaptation step. 'Input port' –– Specify the adaptation step size as one of the inputs to the object. Adaptation step size factor, specified as a non-negative scalar. For convergence of the normalized LMS method, the step size must be greater than 0 and less than 2. A small step size ensures a small steady state error between the output y and the desired signal d. If the step size is small, the convergence speed of the filter decreases. To improve the convergence speed, increase the step size. Note that if the step size is large, the filter can become unstable. To compute the maximum step size the filter can accept without becoming unstable, use the maxstep function. This property applies when you set StepSizeSource to 'Property'. Leakage factor used when implementing the leaky LMS method, specified as a scalar in the range [0 1]. When the value equals 1, there is no leakage in the adapting method. When the value is less than 1, the filter implements a leaky LMS method. Initial conditions of filter weights, specified as a scalar or a vector of length equal to the value of the Length property. When the input is real, the value of this property must be real. false –– The object continuously updates the filter weights. true –– An adaptation control input is provided to the object when you call its algorithm. If the value of this input is non-zero, the object continuously updates the filter weights. If the value of this input is zero, the filter weights remain at their current value. false –– The object does not reset weights. true –– A reset control input is provided to the object when you call its algorithm. This setting enables the WeightsResetCondition property. The object resets the filter weights based on the values of the WeightsResetCondition property and the reset input provided to the object algorithm. Event that triggers the reset of the filter weights, specified as one of the following. The object resets the filter weights whenever a reset event is detected in its reset input. 'Non-zero' –– Triggers a reset operation at each sample, when the reset input is not zero. Rises from a negative value to either a positive value or zero. 'Either edge' –– Triggers a reset operation when the reset input is a rising edge or a falling edge. The object resets the filter weights based on the value of this property and the reset input r provided to the object algorithm. This property applies when you set the WeightsResetInputPort property to true. 'Last' (default) — The object returns a column vector of weights corresponding to the last sample of the data frame. The length of the weights vector is the value given by the Length property. 'All' — The object returns a FrameLength-by-Length matrix of weights. The matrix corresponds to the full sample-by-sample history of weights for all FrameLength samples of the input values. Each row in the matrix corresponds to a set of LMS filter weights calculated for the corresponding input sample. 'None' — This setting disables the weights output. Specify the rounding mode for fixed-point operations. For more details, see rounding mode. 'Same word length as first input' –– The object specifies the word length of step size to be the same as that of the first input. The fraction length is computed to get the best possible precision. 'Custom' –– The step size data type is specified as a custom numeric type through the CustomStepSizeDataType property. For more information on the step size data type this object uses, see the Fixed Point section. Word and fraction lengths of the step size, specified as an autosigned numeric type with a word length of 16 and a fraction length of 15. StepSizeSource property set to 'Property' and StepSizeDataType set to 'Custom'. StepSizeSource property set to 'Input port'. 'Same word length as first input' –– The object specifies the word length of leakage factor to be the same as that of the first input. The fraction length is computed to get the best possible precision. 'Custom' –– The leakage factor data type is specified as a custom numeric type through the CustomLeakageFactorDataType property. For more information on the leakage factor data type this object uses, see the Fixed Point section. Word and fraction lengths of the leakage factor, specified as an autosigned numeric type with a word length of 16 and a fraction length of 15. This property applies when you set the LeakageFactorDataType property to 'Custom'. 'Same as first input' –– The object specifies the data type of the filter weights to be the same as that of the first input. 'Custom' –– The data type of filter weights is specified as a custom numeric type through the CustomWeightsDataType property. For more information on the filter weights data type this object uses, see the Fixed Point section. Word and fraction lengths of the filter weights, specified as an autosigned numeric type with a word length of 16 and a fraction length of 15. This property applies when you set the WeightsDataType property to 'Custom'. 'Same as first input' –– The object specifies the data type of the energy product to be the same as that of the first input. 'Custom' –– The data type of the energy product is specified as a custom numeric type through the CustomEnergyProductDataType property. For more information on the energy product data type this object uses, see the Fixed Point section. This property applies when you set the Method property to 'Normalized LMS'. Word and fraction lengths of the energy product, specified as an autosigned numeric type with a word length of 32 and a fraction length of 20. This property applies when you set the Method property to 'Normalized LMS' and EnergyProductDataType property to 'Custom'. 'Same as first input' –– The object specifies the data type of the energy accumulator to be the same as that of the first input. 'Custom' –– The data type of the energy accumulator is specified as a custom numeric type through the CustomEnergyAccumulatorDataType property. For more information on the energy accumulator data type this object uses, see the Fixed Point section. Word and fraction lengths of the energy accumulator, specified as an autosigned numeric type with a word length of 32 and a fraction length of 20. This property applies when you set the Method property to 'Normalized LMS' and EnergyAccumulatorDataType property to 'Custom'. 'Same as first input' –– The object specifies the data type of the convolution product to be the same as that of the first input. 'Custom' –– The data type of the convolution product is specified as a custom numeric type through the CustomConvolutionProductDataType property. For more information on the convolution product data type this object uses, see the Fixed Point section. Word and fraction lengths of the convolution product, specified as an autosigned numeric type with a word length of 32 and a fraction length of 20. This property applies when you set the ConvolutionProductDataType property to 'Custom'. 'Same as first input' –– The object specifies the data type of the convolution accumulator to be the same as that of the first input. 'Custom' –– The data type of the convolution accumulator is specified as a custom numeric type through the CustomConvolutionAccumulatorDataType property. For more information on the convolution accumulator data type this object uses, see the Fixed Point section. Word and fraction lengths of the convolution accumulator, specified as an autosigned numeric type with a word length of 32 and a fraction length of 20. This property applies when you set the ConvolutionAccumulatorDataType property to 'Custom'. 'Same as first input' –– The object specifies the data type of the step size error product to be the same as that of the first input. 'Custom' –– The data type of the step size error product is specified as a custom numeric type through the CustomStepSizeErrorProductDataType property. For more information on the step size error product data type this object uses, see the Fixed Point section. Word and fraction lengths of the step size error product, specified as an autosigned numeric type with a word length of 32 and a fraction length of 20. This property applies when you set the StepSizeErrorProductDataType property to 'Custom'. 'Same as first input' –– The object specifies the data type of the filter weights update product to be the same as that of the first input. 'Custom' –– The data type of the filter weights update product is specified as a custom numeric type through the CustomWeightsUpdateProductDataType property. For more information on the filter weights update product data type this object uses, see the Fixed Point section. Word and fraction lengths of the filter weights update product, specified as an autosigned numeric type with a word length of 32 and a fraction length of 20. This property applies when you set the WeightsUpdateProductDataType property to 'Custom'. 'Same as first input' –– The object specifies the quotient data type to be the same as that of the first input. 'Custom' –– The quotient data type is specified as a custom numeric type through the CustomQuotientDataType property. For more information on the quotient data type this object uses, see the Fixed Point section. This property applies when you set the Method property to 'Normalized LMS' and QuotientDataType property to 'Custom'. [y,err,wts] = lms(x,d) filters the input signal, x, using d as the desired signal, and returns the filtered output in y, the filter error in err, and the estimated filter weights in wts. The lms filter object estimates the filter weights needed to minimize the error between the output signal and the desired signal. [y,err] = lms(x,d) filters the input signal, x, using d as the desired signal, and returns the filtered output in y and the filter error in err when the WeightsOutput property is set to 'None'. [___] = lms(x,d,mu) filters the input signal, x, using d as the desired signal and mu as the step size, when the StepSizeSource property is set to 'Input port'. These inputs can be used with either of the previous sets of outputs. [___] = lms(x,d,a) filters the input signal, x, using d as the desired signal and a as the adaptation control when the AdaptInputPort property is set to true. When a is nonzero, the System object continuously updates the filter weights. When a is zero, the filter weights remain constant. [___] = lms(x,d,r) filters the input signal, x, using d as the desired signal and r as a reset signal when the WeightsResetInputPort property is set to true. The WeightsResetCondition property can be used to set the reset trigger condition. If a reset event occurs, the System object resets the filter weights to their initial values. [y,err,wts] = lms(x,d,mu,a,r) filters the input signal, x, using d as the desired signal, mu as the step size, a as the adaptation control, and r as the reset signal, and returns the filtered output in y, the filter error in err, and the adapted filter weights in wts. The signal to be filtered by the LMS filter. The input, x, and the desired signal, d must have the same size, data type, and complexity. If the input is fixed-point, the data type must be signed and must have the same word length as the desired signal. The input, x can be a variable-size signal. You can change the number of elements in the column vector even when the object is locked. The System object locks when you call the object to run its algorithm. The LMS filter adapts its filter weights, wts, to minimize the error, err, and converge the input signal x to the desired signal d as closely as possible. The input, x, and the desired signal, d, must have the same size, data type, and complexity. If the desired signal is fixed-point, the data type must be signed and must have the same word length as the data input. The input, d can be a variable-size signal. You can change the number of elements in the column vector even when the object is locked. The System object locks when you call the object to run its algorithm. Adaptation step size factor, specified as a scalar, nonnegative numeric value. For convergence of the normalized LMS method, the step size should be greater than 0 and less than 2. The data type of the step size input must match the data type of x and d. If the data type is fixed-point, the data type must be signed. This input is required when the StepSizeSource property is set to 'Input port'. Adaptation control input that controls how the filter weights are updated. If the value of this input is non-zero, the object continuously updates the filter weights. If the value of this input is zero, the filter weights remain at their current value. This input is required when the AdaptInputPort property is set to true. Reset signal that resets the filter weights based on the values of the WeightsResetCondition property. This input is required when the WeightsResetInputPort property is set to true. Filtered output, returned as a scalar or a column vector. The object adapts its filter weights to converge the input signal x to match the desired signal d. The filter outputs the converged signal. Difference between the output signal y and the desired signal d, returned as a scalar or a column vector. The data type of err matches the data type of y. The objective of the adaptive filter is to minimize this error. The object adapts its weights to converge towards optimal filter weights that produce an output signal that matches closely with the desired signal. For more details on how err is computed, see Algorithms. Adaptive filter weights, returned as a scalar or a column vector of length specified by the value in Length. 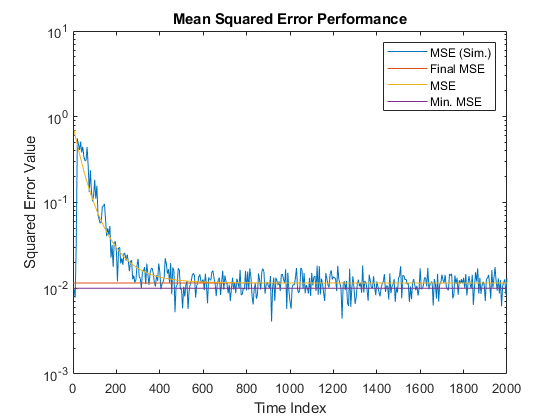 The mean squared error (MSE) measures the average of the squares of the errors between the desired signal and the primary signal input to the adaptive filter. Reducing this error converges the primary input to the desired signal. Determine the predicted value of MSE and the simulated value of MSE at each time instant using the msepred and msesim functions. Compare these MSE values with each other and with respect to the minimum MSE and steady-state MSE values. In addition, compute the sum of the squares of the coefficient errors given by the trace of the coefficient covariance matrix. 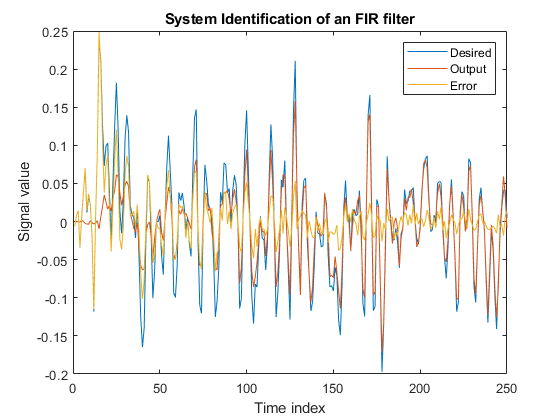 Create a dsp.FIRFilter System object™ that represents the unknown system. Pass the signal, x, to the FIR filter. The output of the unknown system is the desired signal, d, which is the sum of the output of the unknown system (FIR filter) and an additive noise signal, n.
Create a dsp.LMSFilter System object to create a filter that adapts to output the desired signal. Set the length of the adaptive filter to 32 taps, step size to 0.008, and the decimation factor for analysis and simulation to 5. The variable simmse represents the simulated MSE between the output of the unknown system, d, and the output of the adaptive filter. The variable mse gives the corresponding predicted value. Compare the values of simulated MSE, predicted MSE, minimum MSE, and the final MSE. The final MSE value is given by the sum of minimum MSE and excess MSE. The predicted MSE follows the same trajectory as the simulated MSE. Both these trajectories converge with the steady-state (final) MSE. 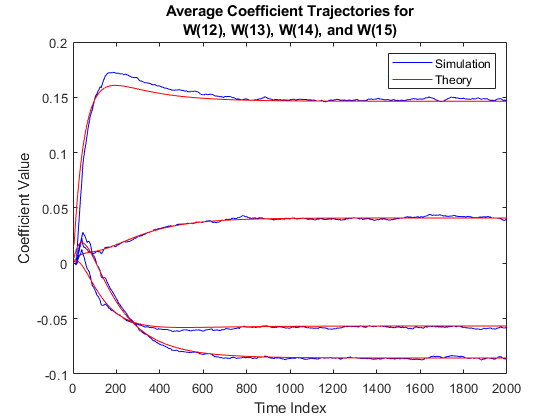 meanWsim is the mean value of the simulated coefficients given by msesim. meanW is the mean value of the predicted coefficients given by msepred. 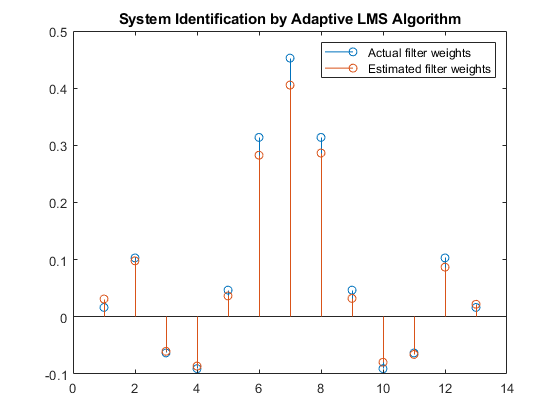 Compare the simulated and predicted mean values of LMS filter coefficients 12,13,14, and 15. In steady state, both the trajectories converge. 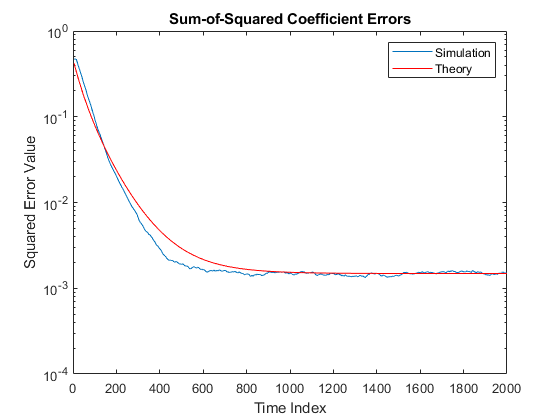 Compare the sum of the squared coefficient errors given by msepred and msesim. These values are given by the trace of the coefficient covariance matrix. The maxstep function computes the maximum step size of the adaptive filter. This step size keeps the filter stable at the maximum possible speed of convergence. 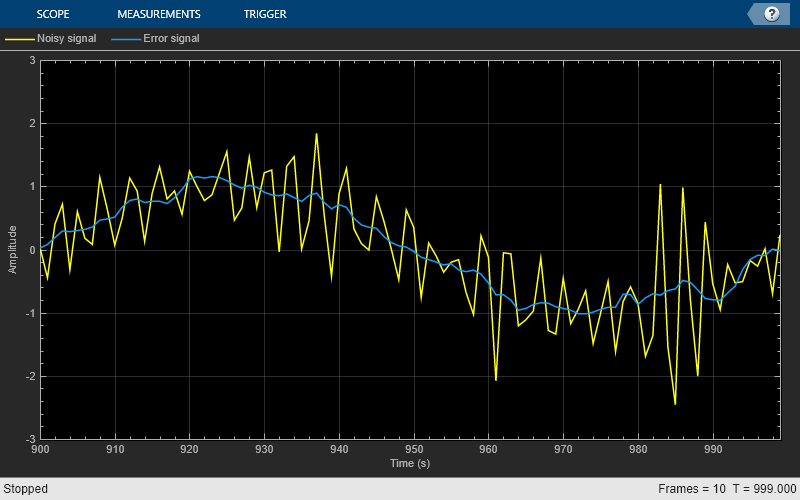 Create the primary input signal, x, by passing a signed random signal to an IIR filter. Signal x contains 50 frames of 2000 samples each frame. Create an LMS filter with 32 taps and a step size of 0.1. Compute the maximum adaptation step size and the maximum step size in mean-squared sense using the maxstep function. Identify an unknown system using an LMS algorithm. The objective of the adaptive filter is to minimize the error signal between the output of the adaptive filter and the output of the unknown system (or the system to be identified). Once the error signal is minimal, the adapted filter resembles the unknown system. Create a dsp.FIRFilter object that represents the system to be identified. Pass the signal, x to the FIR filter. The output of the unknown system is the desired signal, d, which is the sum of the output of the unknown system (FIR filter) and an additive noise signal, n.
Create a dsp.LMSFilter object to create an adaptive filter that uses the LMS adaptive algorithm. Set the length of the adaptive filter to 11 taps and the step size to 0.01. Pass the primary input signal, x, and the desired signal, d, to the LMS filter. The output, y, of the adaptive filter is the signal converged to the desired signal, d, thereby minimizing the error, e, between the two signals. The weights vector, w, represents the coefficients of the LMS filter that is adapted to resemble the unknown system (FIR filter). To confirm the convergence, compare the numerator of the FIR filter and the estimated weights of the adaptive filter. All coefficients of the unknown system (FIR filter) overlap with the coefficients of the adapted LMS filter. Cancel additive noise, n, added to an unknown system using an LMS adaptive filter. The LMS filter adapts its coefficients until its transfer function matches the transfer function of the unknown system as closely as possible. The difference between the output of the adaptive filter and the output of the unknown system represents the error signal, e. Minimizing this error signal is the objective of the adaptive filter. The unknown system and the LMS filter process the same input signal, x, and produce outputs d and y, respectively. If the coefficients of the adaptive filter match the coefficients of the unknown system, the error, e, in effect represents the additive noise. Create a dsp.FIRFilter System object to represent the unknown system. Create a dsp.LMSFilter object and set the length to 11 taps and the step size to 0.05. Create a sine wave to represent the noise added to the unknown system. View the signals in a time scope. Create a random input signal, x and pass the signal to the FIR filter. Add a sine wave to the output of the FIR filter to generate the noisy signal, d. The signal, d is the output of the unknown system. Pass the noisy signal and the primary input signal to the LMS filter. View the noisy signal and the error signal in the time scope. The error signal, e, is the sinusoidal noise added to the unknown system. Minimizing the error signal minimizes the noise added to the system. Note: This example runs only in R2017a or later. If you are using a release earlier than R2017a, the object does not output a full sample-by-sample history of filter weights. If you are using a release earlier than R2016b, replace each call to the function with the equivalent step syntax. For example, myObject(x) becomes step(myObject,x). 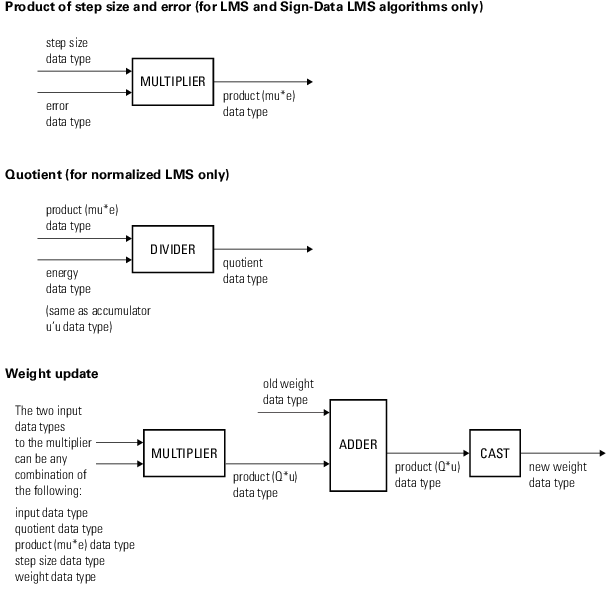 Initialize the dsp.LMSFilter System object and set the WeightsOutput property to 'All'. This setting enables the LMS filter to output a matrix of weights with dimensions [FrameLength Length], corresponding to the full sample-by-sample history of weights for all FrameLength samples of input values. Run one frame and output the full adaptive weights history, w.
Each row in w is a set of weights estimated for the respective input sample. Each column in w gives the complete history of a specific weight. Plot the actual weight and the entire history of the 33rd, 34th, and 35th weight. 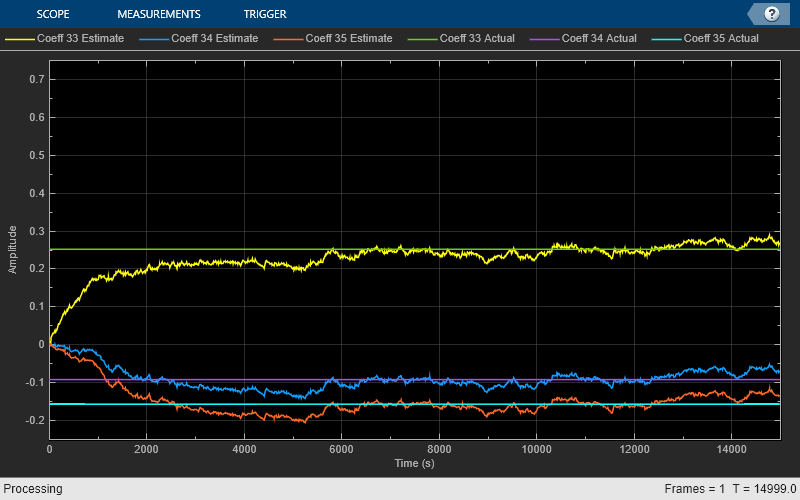 In the plot, you can see that the estimated weight output eventually converges with the actual weight as the adaptive filter receives input samples and continues to adapt. 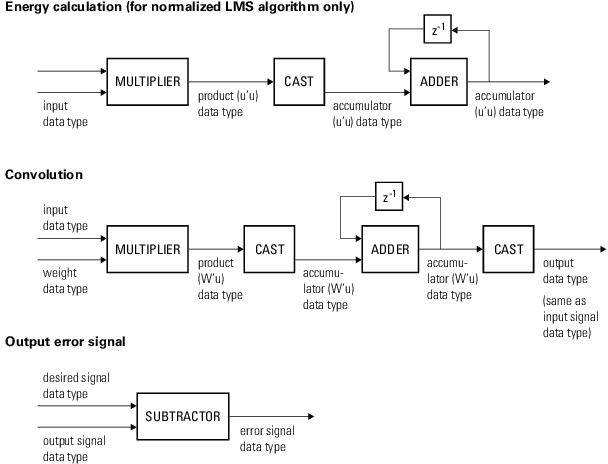 The LMS filter algorithm is defined by the following equations. In Normalized LMS, to overcome potential numerical instability in the update of the weights, a small positive constant, ε, has been added in the denominator. For double-precision floating-point input, ε is 2.2204460492503131e-016. For single-precision floating-point input, ε is 1.192092896e-07. For fixed-point input, ε is 0. A constant that corrects any potential numerical instability that occurs during the update of weights. Hayes, M.H. Statistical Digital Signal Processing and Modeling. New York: John Wiley & Sons, 1996. 1The accumulator data type for this quantity is automatically set to be the same as the product data type. The minimum, maximum, and overflow information for this accumulator is logged as part of the product information. Autoscaling treats this product and accumulator as one data type. The input signal and the desired signal must have the same word length, but their fraction lengths can differ. The step size and leakage factor must have the same word length, but their fraction lengths can differ. The output signal and the error signal have the same word length and the same fraction length as the desired signal. The quotient and the product output of the u'u, W'u, μ⋅e, and Q⋅u operations must have the same word length, but their fraction lengths can differ. The accumulator data type of the u'u and W'u operations must have the same word length, but their fraction lengths can differ. The output of the multiplier is in the product output data type if at least one of the inputs to the multiplier is real. If both of the inputs to the multiplier are complex, the result of the multiplication is in the accumulator data type. For details on the complex multiplication performed, see Multiplication Data Types.